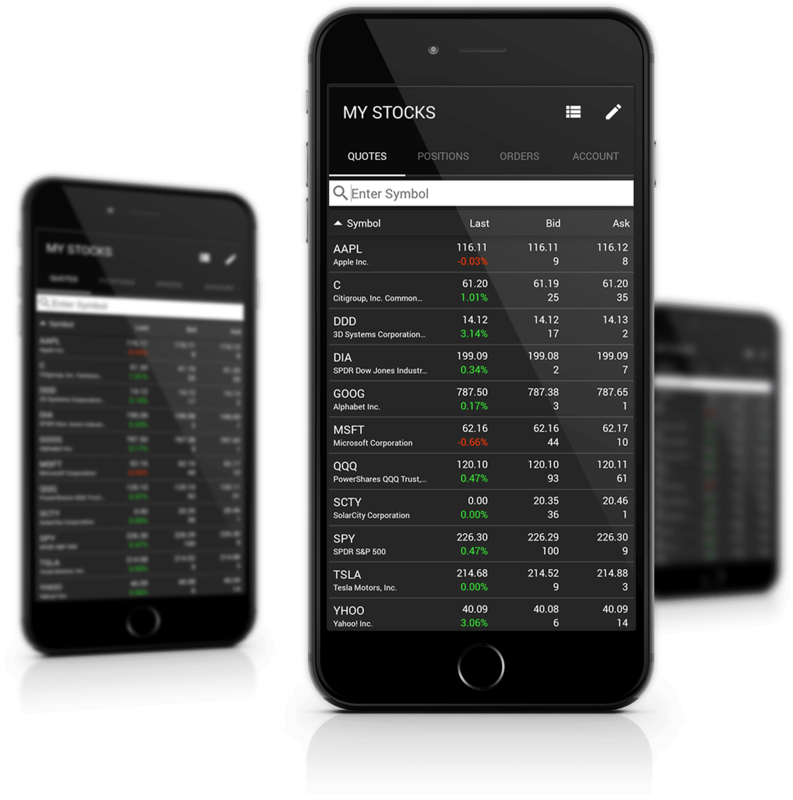 eOption Mobile provides you with account access, trading and order status of stocks, ETF’s and options, including streaming quotes, market news, intuitive charting and account management. Integrated market data enables you to access financial research and execute trades. eOption Mobile was developed using the latest innovations in mobile programming, as well as native technology operation system. Advantages include faster transfer speeds, reliability, and extended functionality. With an extremely user-friendly and highly intuitive design, eOption Mobile provides you with the ability to stay informed and in control of your account from any location. Clients have the ability to place orders of multiple types, and manage or cancel orders, in addition to viewing positions, balances, buying power, activity, open orders and order status. View Positions, Balances, Activity and Open Orders. Create your own watch lists. Choose your favorites. View changes in price by both % and $, bid/ask volume and profit/loss rate. Intuitive candlestick, line, bar and real charting functions that allow you to easily spot market trends and research new trading opportunities using multiple times intervals. View real-time account balances and make adjustments from a smartphone or tablet. Easily manage orders and information, switch between multiple accounts linked to a User ID, and receive messages and notifications. Receive numerous pieces of relevant news within one convenient location based on your quote information page. Do I log-in to eOption Mobile with the same User Name and Password that is used on the eOption website? Yes. Please log in using your previously created User Name and Password. Can I see all of the accounts linked to my User Name using eOption Mobile? Yes. You have access to all accounts linked to your User ID. Can I place trades on eOption Mobile? Yes. You may place stock, ETF, and including complex option orders using eOption Mobile. When entering a dollar amount that is less than $1.00, you will need to enter “0” first. For example, when placing an order for 50 cents, you will have to enter 0.50, not .50. Can I trade in extended hours? No. Extended hours trading is not available using eOption Mobile. What account information is available on eOption Mobile? Easily manage orders and information, switch between multiple accounts linked to a User ID, and receive messages and notifications. Will I be able to view my Buying Power in my account? Yes. Buying Power is displayed in the Balance section as well as the Trading page. Will I receive real-time data on eOption Mobile? Yes. eOption Mobile users have access to real-time quotes, news, charts and options.